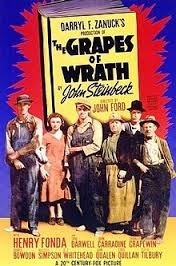 The Grapes of Wrath by John Steinbeck was published in 14 April 1939 and won the annual National Book Award and Pulitzer Prize and was cited prominently when he won the Nobel Prize in 1962. Set during the Great Depression, the novel focuses on the Joads, a poor family of tenant farmers driven from their Oklahoma home by drought, economic hardship, and changes in financial and agricultural industries on their journey to find jobs, land, dignity and a future. One of the son’s Tom Joad is paroled from McAlester prison for homicide and while returning home near Sallisaw, Oklahoma, he meets An old friend named Casy. On reaching his Farm Home they find it, deserted and an old neighbor, Muley Graves, informs them that they are at Uncle John Joad’s home nearby because the banks have evicted all the farmers and repossessed the farms after the crops failed and they were unable to pay the bank back. Tom finds his family at Uncle Joad’s and learns that they are planning to seek work in California. Although leaving Oklahoma would be breaking parole, Tom decides it is worth the risk. Traveling west on Route 66, the Joad family find the road crowded with other “Okie” migrants Sheltering In makeshift camps. On the way Granpa and Granma die and both Noah (the eldest Joad son) and Connie Rivers (the husband of the pregnant Joad daughter, Rose of Sharon) split from the family. Led by Ma, the remaining members realize that nothing is left for them in Oklahoma and continue to California. On Reaching California, they find that The big corporate farmers are exploiting the workers and smaller farmers are suffering from collapsing prices. Weedpatch Camp, one of the clean, utility-supplied camps operated by the Resettlement Administration, a New Deal agency, offers better conditions, but does not have enough resources to care for all the needy families. As a Federal facility, the camp protects the migrants from harassment by California deputies. Casy then creates a Labour union to protect the workers The remaining Joads work as strikebreakers in a peach orchard where Casy is involved in a strike that eventually turns violent. When Tom Joad witnesses Casy’s fatal beating, he kills the attacker and flees as a fugitive. The Joads later leave the orchard for a cotton farm, where Tom is at risk of arrest for the homicide. As if this isn’t bad enough Rose of Sharon’s baby is stillborn, then the Joads’ dwelling is flooded leading to yet more hardship. 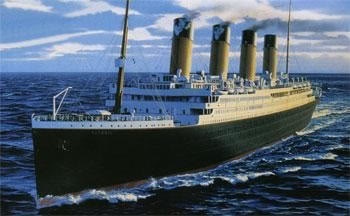 The sinking of the RMS Titanic occurred on the night of 14 April 1912 when she struck an iceberg at 23:40 (ship’s time) on Sunday, 14 April and sank two hours and forty minutes later at 02:20 (05:18 GMT) on Monday, 15 April, in the north Atlantic Ocean, four days into her maiden voyage from Southampton to New York City resulting in the deaths of 1,514 people. The ice conditions at the time were attributed to a mild winter which caused large numbers of icebergs to break away from the west coast of Greenland. In addition, it is now known that in January 1912, the Moon came closer to the Earth than at any time in the previous 1,400 years. This caused exceptionally high tides that may have resulted in a larger number of icebergs than usual reaching the shipping lanes a few months later. This is regarded as his last hard rock album. Rainbow was put on hold once again after playing its final concert in 1997. 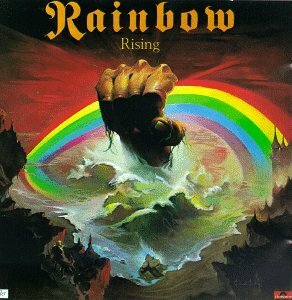 Over the years Rainbow went through many personnel changes with no two studio albums featuring the same line-up: Blackmore was the sole constant band member. In 1997 Blackmore, with his girlfriend Candice Night as vocalist, formed the traditional folk rock duo Blackmore’s Night. Around the same time as Stranger in Us All, they were producing their debut album Shadow of the Moon and Candice Night subsequently became Blackmore’s creative partner. Blackmore described their sound as “Mike Oldfield plus Enya” Blackmore mostly utilised acoustic guitar, to back Night’s delicate vocals. The band’s musical style is inspired by his favorite Renaissance music and blends with Night’s lyrics about medieval themes and fantasy. They recorded a mixture of original and cover materials. The second album released by Blackmore’s Night was entitled Under a Violet Moon and continued the folk-rock style, Blackmore was ranked number 16 on Guitar World’s “100 Greatest Metal Guitarists of All Time” in 2004, and number 50 in Rolling Stone magazine’s list of the “100 Greatest Guitarists of All Time” in 2011.